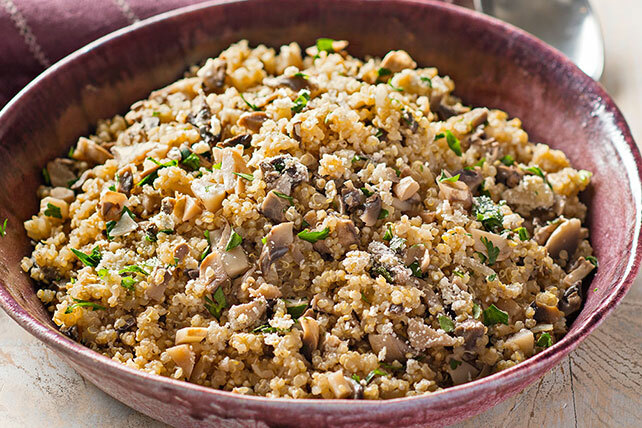 Cook an alternative to rice with Mushroom-Quinoa Pilaf with grated Parmesan. Thanks to the quinoa, this Mushroom-Quinoa Pilaf is a better-for-you choice. Heat dressing in large saucepan on medium-high heat. Add mushrooms and onions; cook and stir 5 min. or until onions are crisp-tender. Stir in broth; bring to boil. Add quinoa; stir. Return to boil; cover. Simmer on low heat 16 to 18 min. or until liquid is absorbed and quinoa is tender. Remove from heat; fluff with fork. Let stand, covered, 5 min. Stir in cheese and parsley. For a meatless version, prepare using vegetable broth.